This mighty vehicle's offroader wheels and suspension means it can power across the roughest terrain. When you get the Stone Army's base camp in your sights, fire the 6-stud rapid shooter and detach Lil' Nelson's turret. Dodge the base camp's disc shooter. Spin the Rock Roader's dangerous rear driller and beware of the Stone Army warriors' Elemental Blade and stud-shooting crossbow. Then, attach the spinning driller to the front of the Rock Roader to smash their base camp and drive away victorious! Last known price is 4% below the initial Lego retail price! 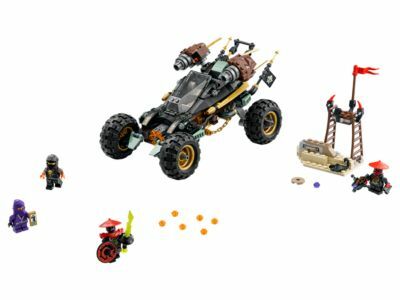 The Rock Roader (70589) Lego set is no longer directly available from the sites below. However, 3rd party partners of these sites might still have the set available. Alternate description Attack the Stone Army's base camp with Cole RX's Rock Roader, featuring a 6-stud rapid shooter and detachable turret. Includes 4 minifigures and an Elemental Blade. Includes 4 minifigures: Cole RX (with a special outfit and hood), Lil' Nelson with a hood, a Stone Swordsman and a Stone Scout. The set features a Rock Roader vehicle and the Stone Army base camp. The Rock Roader features an opening cockpit for Cole RX and Lil' Nelson, 4 rubber offroader wheels, full suspension, 6-stud rapid shooter, rotating rear driller, and Lil' Nelson's detachable turret with boosters and 4 golden swords. Activate the Rock Roader's rapid shooter by pressing down on the vehicle while driving or attach the rear driller to the front and make it spin by the same method. The Stone Army base camp features a lookout point, disc shooter, flag and translucent flame element. Weapons include the Stone Swordsman's Elemental Blade and the Stone Scout's stud-shooting crossbow. Also includes a shield accessory element. Recreate and role-play epic scenes from the NINJAGO™: Masters of Spinjitzu TV show. Rock Roader measures over 4” (11cm) high, 8” (22cm) long and 5” (14cm) wide. Stone Army base camp measures over 4” (11cm) high, 3” (8cm) wide and 1” (4cm) deep.